HP C6656AN (No. 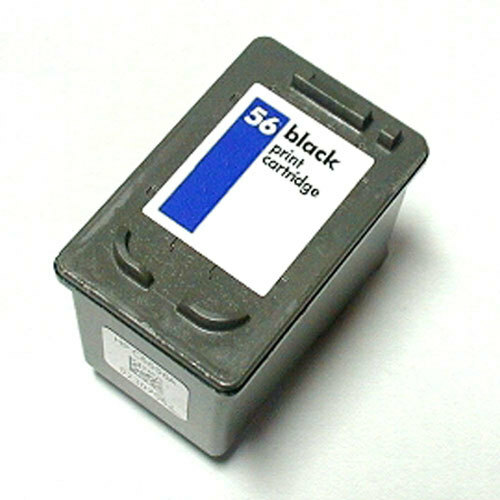 56) Remanufactured Black Inkjet Cartridge at unbelievable price saves you money without sacrificing quality. The compatible inkjet cartridge (also known as generic) are specially engineered to meet the highest standards of quality, reliability and exceptional yields that meet to exceed OEM (Original Equipment Manufacturer) standards and offer high-quality results. If you're looking for maximum performance, reliability and dramatic savings, this inkjet cartridge is the choice for you. 100% satisfaction guaranteed. Please note: This product photo is for reference only and does not necessarily resemble the product that you will receive. All compatible inkjet cartridges have a 30 day money back guarantee. If, at any time within 30 days from the invoice date, you are not completely satisfied with the performance of our ink cartridge(s), we will replace or refund your order. It's that simple! Unfortunately, we can not issue a replacement after 120 days of original date of purchase. All returned ink cartridges will be inspected and tested and must be at least 80% full. Please do not mark the original manufacturer's box. All returns MUST be in the original box in which they came and have the original UPC codes on the box. Customer is responsible for return shipping charges, unless otherwise pre-approved by our return department. Just got the cartridge today and did a test print. Everything looks great! Lowest price I've been able to find and even came with a free gift. What's not to love? Bought 1 black cartridge for old HP Deskjet 5550 to try it out. Read review about low ink level so that was what I checked first and it showed completely full after installation. No difference in print quality, and have printed quite a few "Photo Ret" quality images on photo paper. Like this cartridge so well I ordered 4 (of 6) cartridges for my Epson RX620. Inkjet printers themselves are quite reasonably priced, but in a year it's easy to spend as much on ink cartridges as you have for the printer itself. I plan on making Shop4Tech my place to purchase most supplies (ink cartridges, DVD cases, and blank DVD media, etc.) Thanks Shop4Tech!